One of the drawbacks of running a blog that reviews nachos across Boston and around the globe is that, well, you have to eat nachos. All the time. No matter how famously outstanding the house specialty may be, if we see nachos on the menu, we feel compelled, nay, mandated to order them. And as we learned very early on in our journey, it is unwise and often impossible to eat a main course after nachos. So we are a bit remorseful about our first trip to RF O’Sullivans & Sons, because from our kitchen-side perch at the bar we could see all sorts of delicious burgers being fried up on the grill…while another cook microwaved a bowl of chili and poured it over tortilla chips from a bag to prepare nachos for someone else. As we pored over the extensive, inventive burger menu, the words of Albus Dumbledore rang through our heads: “Soon, we will all have to make a choice between what is right, and what is easy.” And this time, we did what was right– we ordered the nachos and gave up any burger dreams, at least for that night. Appearance: (5) Not exactly grim, but we knew that we weren’t in for the most varied nacho plate. The only color variation came from the salsa and jalapenos in plastic cups on the side. Quality of Ingredients: (6) The round chips were very salty. The chili and cheese were decent; the salsa, from a jar. And…that’s about all. Distribution of Toppings: (5) We quickly condensed our thoughts about the distribution into this: too much of not enough going on. That is, these were smothered in chili and cheese, but to a cloying point: chips were buried and sodden, and we would have loved to see a more open, lofty distribution, with more variety. The round chips were partly to blame for the packed nature of these nachos. Price: (7) At approximately $9, these were…standard. Though we didn’t get to try them, we will venture that your money is much better spent on a burger. Overall: 23/40. It feels, as of late, that we have moved from hunting down the best nachos in Boston to curating a list of restaurants to avoid/at least avoid the nachos. At times, this can be wearying. But then we come across a place like this; while the nachos may not be great, they are what brought us in the door, and introduced us to a lovely, friendly gem of a place and a lovely, friendly gem of a bartender whose in-depth knowledge of Arnold Schwarzenegger’s filmography helped us to clinch 3rd place in Stump Trivia and a free order of cheese fries. 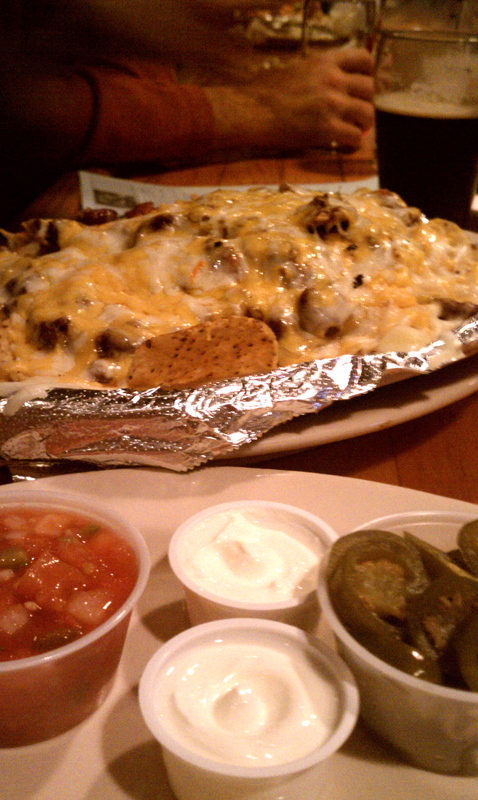 We don’t regret the nachos, or begrudge them their mediocrity– all’s well that ends well!